Free, unlimited cloud storage and the promise of the latest updates make the Pixel intriguing. See ya, Nexus! Google has announced its new Pixel and Pixel XL phones, as expected, which will be powered by Google’s new Google Assistant. 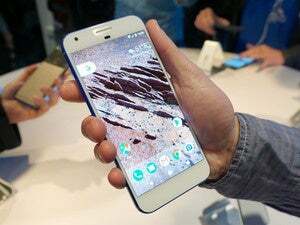 Google launched the Pixel in both a standard as well as a jumbo size, the Pixel XL. 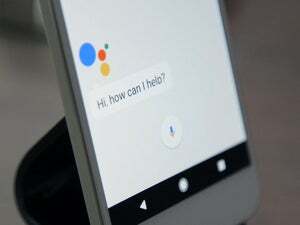 But the 5-inch Pixel and 5.5-inch Pixel XL aren’t noteworthy because of their hardware, but because of the software and services attached to them: not only will users be able to launch the interactive Google Assistant from their home buttons, but the phones will come with an unlimited amount of cloud storage for photos and videos at original quality —even 4K!—compliments of Google. The Pixel will cost $649 (or $27 per month) exclusively from Verizon, with the 128GB model available for $750. Verizon will charge $770 for the 32GB Pixel XL, and a whopping $870 for the 128GB model. (Verizon will also allow buyers to amortize their purchase by paying a monthly fee; for example, the most expensive 128GB Pixel XL will cost $36.24 per month for 24 months, at 0 percent interest.) Verizon lists the delivery dates for both phones as Oct. 20. If you order from Google, however, the company will throw in a free Dayream View VR headset. With Assistant, “The goal is to build a personal Google for each and every user,” said Sundar Pichai, the chief executive of Google, at the company’s launch event in San Francisco. Some of the Google Pixel specs. That’s important, because Pixel buyers will have the choice of 32GB or 128GB of local storage—with nothing in between—meaning that they can choose to store very little on their phone, or virtually everything. Google didn’t mention an SD card slot, unfortunately. Software head Brian Rakowski showed off several capabilities of Assistant: playing music from the Lumineers, looking up a local venue, and then researching and even booking a dinner reservation with OpenTable. Assistant used the context of the conversation to understand what Rakowski was talking about. 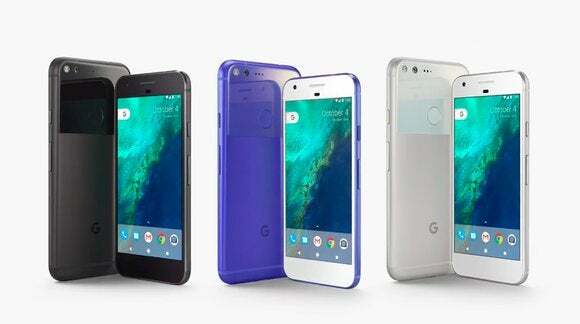 Google said that the both the Pixel and the Pixel XL will include a 12.3-megapixel rear camera as well as an 8-megapixel front-facing selfie camera. Though the megapixel count is lower than in some competing phones, the Pixel has 1.55-micron image sensors and a f/2.0 aperture—the emphasis here is on capturing sharp pictures in low light, the priority for most modern flagship smartphones. “The camera on Pixel is just excellent,” Rakowski said. By holding down the camera button, the camera will take a "smart burst": a stream of images, of which Google will pick the best shot. A new technology called HDR+ splits the shot into multiple short exposures, minimizing noise and blur and providing better dynamic range. HDR+ is on by default, since there’s virtually zero shutter lag, Rakowski said. The camera has a faster shutter time than any one the company has tested, he said, and camera stabilization for video is also there as well. The phones will be made of aluminum, and without the “unsightly” camera bump that comes on other phones, said Rick Osterloh, the head of Google’s new hardware division. 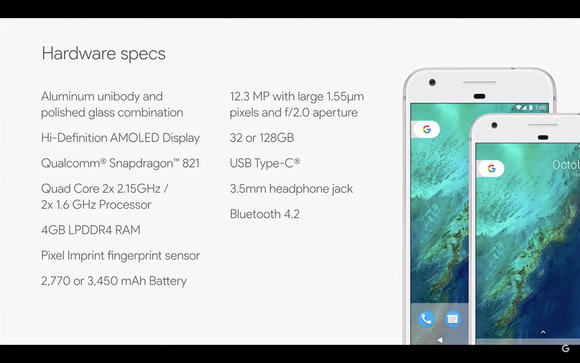 The Pixel has a standard 5-inch, 1920x1080 (534 ppi) AMOLED phone, the Pixel XL includes a 5.5-inch, 2,560x1,440 (441 ppi) AMOLED display. Gorilla Glass 5—which Corning says will protect the phone from 5-foot drops onto hard surfaces about 80 percent of the time – will cover the front. Oh, and there’s a 3.5-mm headphone jack, too. 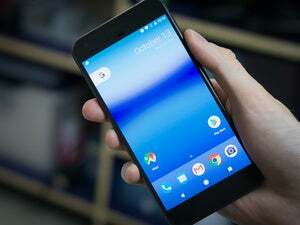 According to Google, you’ll be able to unlock your Pixel with a one-touch fingerprint sensor—also a feature of the iPhone, but also Android phones like the Google’s Nexus 5, the OnePlus 2, and the Galaxy Note 5. Both phones are powered by a quad-core Qualcomm Snapdragon 821 64-bit processor, which apparently takes the same “big-little” approach as the iPhone 7: a a pair of 2.15-GHz cores when your phone needs the extra power, and a pair of 1.6-GHz cores for lower-power tasks to optimize battery life. Each phone also contains 4 GB of LPDDR4 memory. Google has also hidden a 2,770mAh battery within the Pixel as well as a 3,460mAh battery within the Pixel XL. Neither appear to be removable, unfortunately. Everything will be powered by a USB-C cable, with a quick-charge adapter. Google help support will be built in, and there will be a range of cases. It will be available in black, silver, and blue. It will also be ready for DayDream, Google’s VR solution. Updated at 11:30 AM with additional pricing details from Verizon and at 1:21 PM to note the free Daydream View if you order from Google.